…and here’s another one. Cat is another survivor/overcomer who I admire greatly. It seems apt to re-blog this as I have just posted my re-blog from Phoenix. Different people, different years, different towns, different circumstances. Same pain, same trauma, same evil. Like my previous request, please, please pray for Cat too. Cat is such a lovely, warm, person who has to live with these terrible memories. 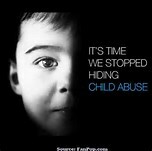 Child abuse must be exposed, not hidden or ignored. It has to stop. The extraordinary events on that hot summer’s day only transpired because my car was in the repair shop. Instead of driving to the seaside, I wander through our local park. I offer him a couple of clues to who I am and within seconds, Simon utters my name in disbelief. He laughs, “You’re the image of your Dad.” We shake hands and hug with incredible warmth, but our happiness soon merges with memories of something quite different… the secret. Next Next post: What’s In That Cupboard?